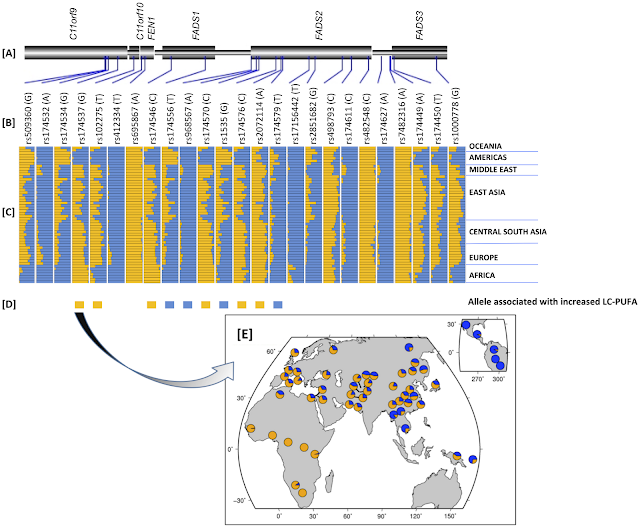 Given 207 fixed differences between chimpanzee and human in this region, we estimate a TMRCA of 1.49 (SEM = 0.23) million years for the human haplotypes. Similarly, only considering the number of mutations within the haplotype group D1, the TMRCA was 85,000±84,000 years, thus suggesting that selection in Africa occurred approximately 85 kya. Jointly, these two sets of data support the hypothesis that advantageous mutations within the FADS gene cluster occurred prior to human migration out of Africa (~85 kya), and swept to fixation within African but not European or Asian populations. I don't know how 85+/-84 can be used to infer that this selection occurred prior to the human migration Out-of-Africa. It seems to me that 85+/-84 is compatible with a wide variety of events. On top of this, this date depends on human-chimp split (=6.5Ma), for which a recent estimate of 7-13Ma has been advanced recently, but also 3.7-6.6Ma. So, I would say that uncertainty about when this selection took place leaves little room for pronouncements that it took place either before, or after Out-of-Africa. I sometimes think that intellectual commitment to recent Out-of-Africa-and-never-back is so strong, that the obvious explanation is overlooked. When Africans are polymorphic and Eurasians are not, this is explained as the result of the OoA bottleneck. When Africans are monomorphic and Eurasians are not -as in this paper- this is explained as the result of selection-to-fixation in Africans. Now, I don't doubt that there was selection in Africans at the FADS gene cluster. But, rather than imagine that African humans were "tethered to marine sources for LC-PUFAs in isolated geographic regions" throughout the ecologically diverse and geographically huge continent of Africa, I can simply imagine that there was a spread of the adaptive haplotype into Africa, followed by selection, as modern humans, who originated, perhaps, in North Africa, had to drastically shift their diet as they entered Sub-Saharan Africa. I am not convinced that this is what happened, but it is certainly worthy of consideration. Rasika A. Mathias et al. "We hypothesize that selection at FADS variants, which increase LC-PUFA synthesis from plant-based MC-PUFAs, played an important role in allowing African populations obligatorily tethered to marine sources for LC-PUFAs in isolated geographic regions, to rapidly expand throughout the African continent 60–80 kya." Sounds as though the authors were absolutely committed to the 'great southern coastal migration' before they even started. It seems extremely unlikely that the whole African population at the time was confined to coastal regions. "I sometimes think that intellectual commitment to recent Out-of-Africa-and-never-back is so strong, that the obvious explanation is overlooked". Agreed. Although I'm worried about what German will make of the completely blue pie diagrams in Central and Southern America. "On top of this, this date depends on human-chimp split (=6.5Ma), for which a recent estimate of 7-13Ma has been advanced recently, but also 3.7-6.6Ma." "we estimate a TMRCA of 1.49 (SEM = 0.23) million years for the human haplotypes". 1.5 million years is quite believable but does imply that human populations have been swapping genes since H. erectus times.